As conversations go, one that Serious Pig founders George and Jonny had in a north London pub back in 2009 has been pretty fortuitous. On one of many lost evenings the pair found themselves pondering a question - what would be the perfect snack to accompany a pint of real ale and glass of Bordeaux? Several discarded packets of crisps, scratchings and nuts later - the boys agreed that something more 'serious' was required and the concept of a 'Posh Pepperami' was hatched. 'Serious Pig' was born the very next day! Stocked in Fortnum & Mason, WholeFoods, BrewDog bars and Heston's 2 pubs in Bray we now bring you opportunity to purchase combinations of our products that are literally not available on the high street. 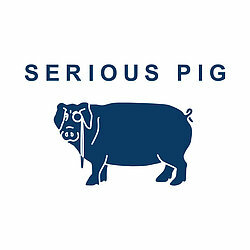 All beautifully presented in an exclusive branded Serious Pig canvas bag that's not just for life, it's a design icon! All our pork is British, outdoor bred and RSPCA accredited. 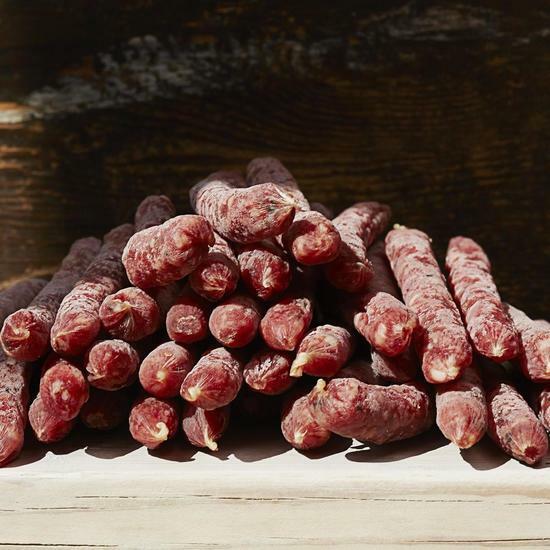 Our delicious salami has been blind taste tasted by The Guild of Fine Food experts and awarded Great Taste Awards. We’ve teamed up with our friends BrewDog to offer their groundbreaking Punk IPA as part of our range - it’s a post modern classic!